Whether you're renovating a house or just performing an exterior health check, ignoring a poorly maintained roof can be disastrous. Just a couple of damaged or missing tiles or slates will quickly allow water to penetrate a building’s fabric, resulting in damage to the timbers and ceilings below. Where such a problem is left unattended, it will ultimately lead to widespread rot and decay. Then the wind may get under any loose roof covering causing more destruction, eventually needing expensive structural repairs to put things right. As part of a twice-yearly exterior maintenance routine, look at the roof, preferably using binoculars, to identify potential problems early on. It is relatively easy to check for problems from ground level or, if you have them, from dormer windows and roof lights. This may need to be done from a neighbour’s garden. Methodically examine for slipped, missing or broken tiles. In addition, pay attention to junctions and places where the roof changes direction. Look for damaged or missing ridge and hip tiles, missing or cracked mortar flaunchings and fillets, as well as corroded or split metal flashings. When these fail, they are likely to let in water, especially around chimneys and at parapet walls. If there is safe access to the loft examine the underside of the roof for damage, especially when it is raining. Check the floor for water stains or broken pieces of slate or tile. Look out for wet, rotten or worm-eaten roof timbers and try to trace the source of any water penetration. Other vulnerable areas are junctions between the walls and where chimney stacks penetrate the roof, so note any water staining but do ensure it is current rather than historic – try to do inspections during or after heavy rain. Remember that water tends to travel, so it may not be obvious where the problem is. While in the roof space, turn off any internal lights and look for places where daylight is coming through the roof covering. If roof timbers appear to be damaged or under strain a structural engineer or surveyor should be consulted. The undulating quality of a roof does not necessarily indicate a defect but might be the result of gentle distortion and settlement over many years. Also ensure that roof insulation materials are not blocking the eaves or hampering ventilation in the roof space as this will cause moisture build up. Roof repairs are generally best left to a professional roofer who understands old buildings and has the appropriate access equipment. Replacing a few tiles or slates is a relatively simple job but it is also important to work out why a problem has occurred and whether it is indicative of a larger failure. A roofer should be able to undertake minor repairs but it may be necessary to employ a surveyor or structural engineer and a carpenter, all of whom should be experienced in working on buildings of the age and type involved. Remember, that it is very difficult to carry out structural repairs once the covering is replaced. Avoid quick-fix methods such as spray-on foams and other coatings as they increase the risk of timber decay, prevent proper future inspection of the roof and invariably mean that roof coverings cannot be salvaged for reuse. Changes in roof direction and junctions with chimneys and parapet walls are weak points. Careful investigation may be needed as defects can be hard to spot, and moisture often follows unexpected routes. Beetle infestation, timber decay, poorly executed alterations and undersized rafters are common problems. These are compounded when a roof covering is replaced with a heavier material, such as concrete tiles. Flat roofs, which may be covered in a variety of materials including lead, copper, zinc, asphalt or bitumen, require regular monitoring. Thatch should be relatively maintenance-free but should still be regularly checked and, where problems are suspected, a thatcher should be called promptly. Due to the danger of fire, monitoring and maintaining the chimney stack is a priority; the flue should be swept twice a year. Which roof materials to use? All roofing repairs are best made using the appropriate traditional methods and using like-for-like materials. Where mortar fillets need to be replaced, lime mortar rather than cement should be used. Clay tiles: Both hand- and machine-made clay tiles are available. Most tile manufacturers also make ‘specials’ to replace the likes of decorative ridge tiles. While modern tiles have nibs that hook onto the roofing laths, traditional peg tiles have holes to accommodate a wooden peg. Tiles can eventually become porous, making them vulnerable to frost. 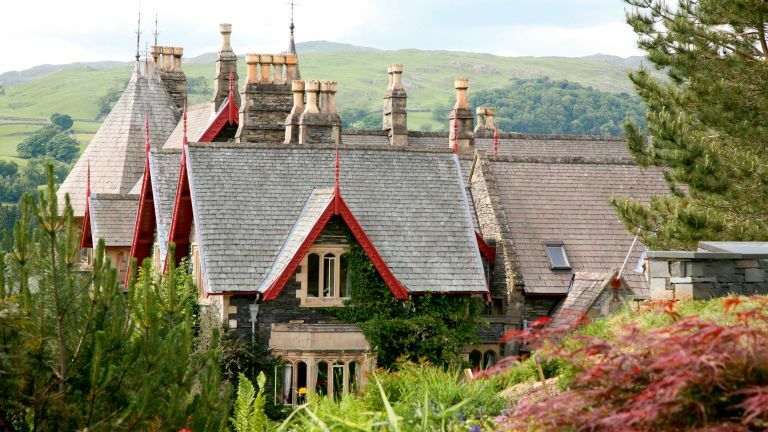 Slates: Welsh slates, held in place with nails, have been widely used on buildings across Britain, and are longlasting, lightweight and hardwearing. Stone tiles: In stone-bearing regions, sandstone and limestone tiles are laid in graduated courses: the biggest at the eaves, the smallest at the ridge. Lead: An attractive and long-lasting roofing material, repairs to lead roofs should be undertaken by a specialist leadworker. Thatch: Widely used for centuries, thatching today is generally in either long straw, combed wheat reed or water reed, and there are distinct regional variations in thatching styles.